Convey your heartfelt wishes by gifting this Adorable Love Array to the people dearest to you. 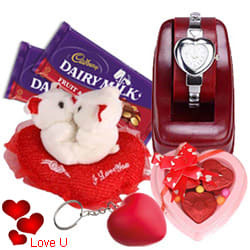 This exquisite Gift is featured with a Kissing Teddy, 3 Pcs Heart Shaped Chocolates, 2 Pcs Dairy Milk Chocolate Bars, a Heart Shaped Key Ring and a Heart Shaped Watch. Flowers Delivery Cuddapah, Send sweets Warangal, Wedding Cake Siliguri, Diwali Mithai Bareilly, Send Flowers and Gifts to Kozhikhode, Online Shop Jamshedpur, Flower to Gulbarga, New Year Flowers Khammam , Fresh Fruits Rishra, Send Gift Mysore, Dry Fruits to Kurnool, Birthday Delivery Vasco, Sending to Bombay, Flower shop Shantiniketan, Bellary Online Cake Delivery.